BUCCANEERS commence their All Ireland League campaign with an intriguing home fixture against Naas in Dubarry Park on Saturday, kick off 2.30pm. There was little between the teams in 2016/17 with early and late scoring spurts earning a 24-16 victory for Buccs at Forenaughts and the midlanders clinched the Division 1B title with a hard earned 30-23 home victory. 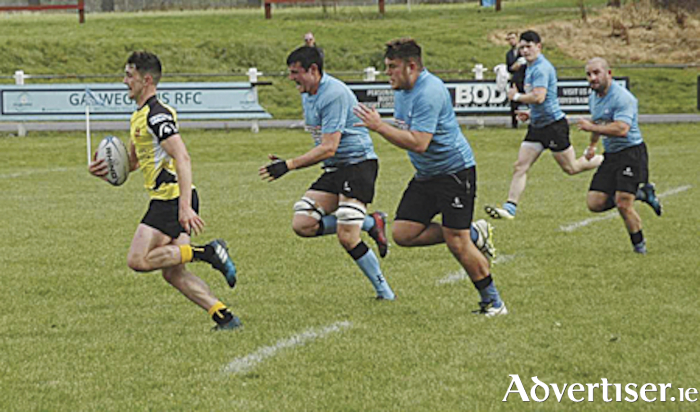 Defeat then for Naas meant that their promotion chance was gone but it was their debut season at that level and they acquitted themselves admirably, as they also did last year when again being among the pacesetters. Buccs will be much changed from previous meetings with Naas. Forwards Martin Staunton, Simon Meagher, Ruairi Byrne and John Sutton all featured then, while the Athlone side’s backline will have a radically different look to it with Gaughan departed and skipper Shane Layden injured. Frankie Hopkins and, if available, Conor McKeon could be the only two to have played when the sides last met just 19 months ago. A new coaching team is also in place at Dubarry Park and the players have both enjoyed and bought in to the ethos and ideas of Head Coach Peter O’Donnell (who was assistant coach at Naas in 2014/15 ) and his assistant Aidan Wynne. They have instilled a good work ethic, as evidenced by narrow late victories forged by sustained endeavour from a mainly very youthful squad that secured a fourth successive Connacht Senior League title for the Athlone club. Due to Connacht Eagles involvement in the new Celtic Cup, Buccaneers had to frustratingly make do without their Academy and Development players. But this provided an opportunity for promising yet inexperienced players to stake their claims for selection on AIL match days. There will be a pre-match function in The Bounty at Dubarry Park for Saturday’s All-Ireland League opening fixture. For just €30 you can enjoy a three course meal including wine, get a complimentary 100 page match programme and free admission to the stand for the match. To book or enquire, contact club administrator Geraldine at 0861732711 or email [email protected]. It may be a Leinster League U20 qualifier but it’s a Connacht derby to decide whether Buccaneers or Galwegians secure Division 2 status for the coming season in the J.P. Fanagan Premier. Dubarry Park hosts this fixture on Sunday with kick off at 3pm. A good number of last season’s players are still underage and Buccs squad will be boosted by a cohort from the club’s double winning U-18.5 outfit. While some of their U20s such as Corey Reid and Niall Murray will surely be involved with the Pirates senior XV when available, the Athlone club nevertheless has burgeoning talent in Michael Hanley, Colm Reilly, James Kelly, Darren Browne, Harry O’Neill, Sean O’Connell and Ross Murphy-Sweeney. Conor Watt and Gianluca Monticone will add a cosmopolitan feel to the panel while young guns such as Liam Winnett, Saul O’Carroll, Fergus Galvin and Darragh Murray should be itching to be involved. On home soil, if Buccs play to their collective potential, are focused and disciplined, they can come out on top in what will surely be a feverishly contested duel. Annual membership subscriptions are due. Payment can be made online at www.buccaneers.ie or by calling into the club’s office at Dubarry Park 9.30am to 3pm daily. Parents can also make payment on Saturday mornings via management of their children’s respective teams.